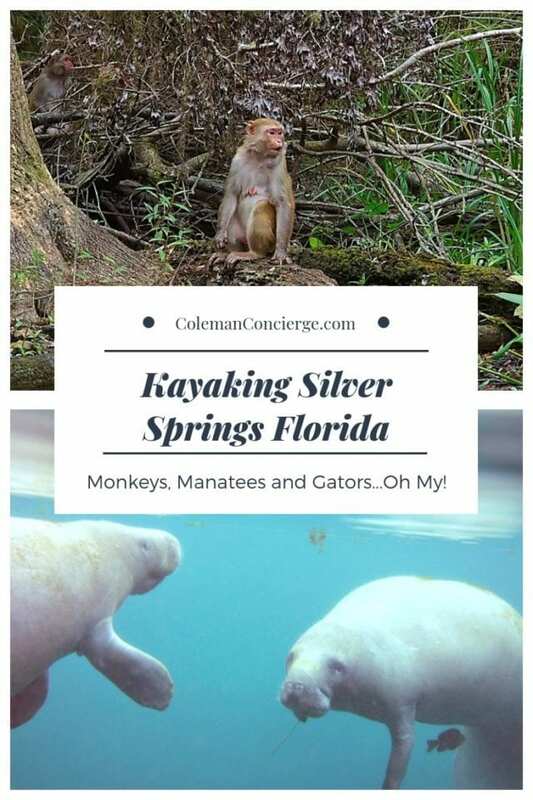 Kayaking Silver Springs - Monkeys, Manatees and Gators...Oh My! 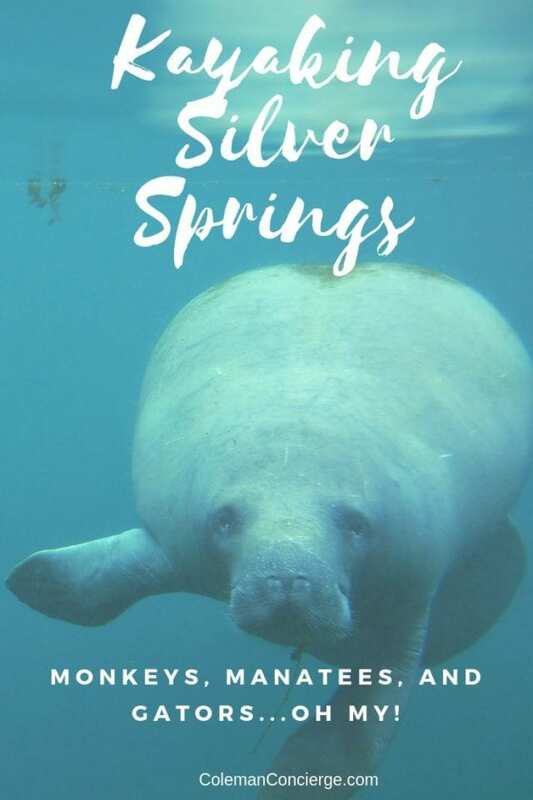 Imagine kayaking Silver Springs with manatees swimming in crystal clear water and monkeys swinging through the trees beside you. If this sounds like a movie, you might be onto something. 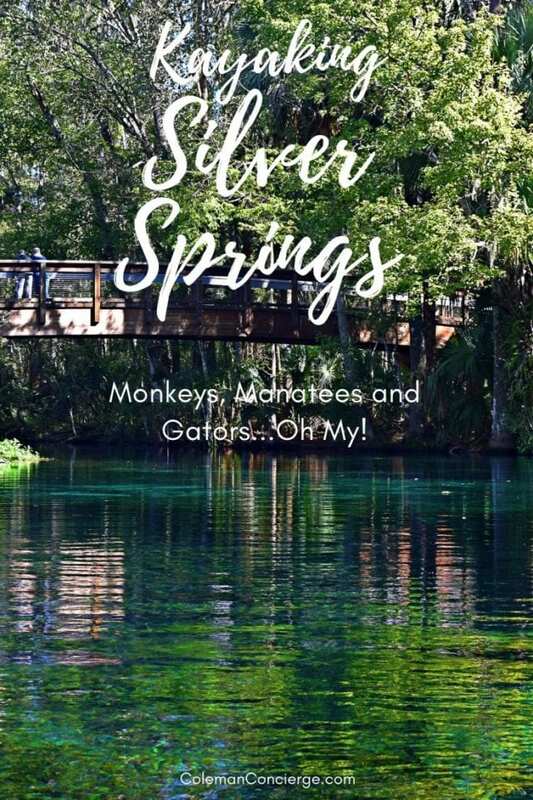 Silver Springs State Park in Florida is one of the largest artisan springs ever discovered and the only place in America you can see manatees and wild monkeys on the same trip. 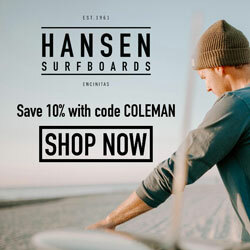 It is also the filming location for the black and white Tarzan movies, Creature From the Black Lagoon and a host of other films and TV shows. 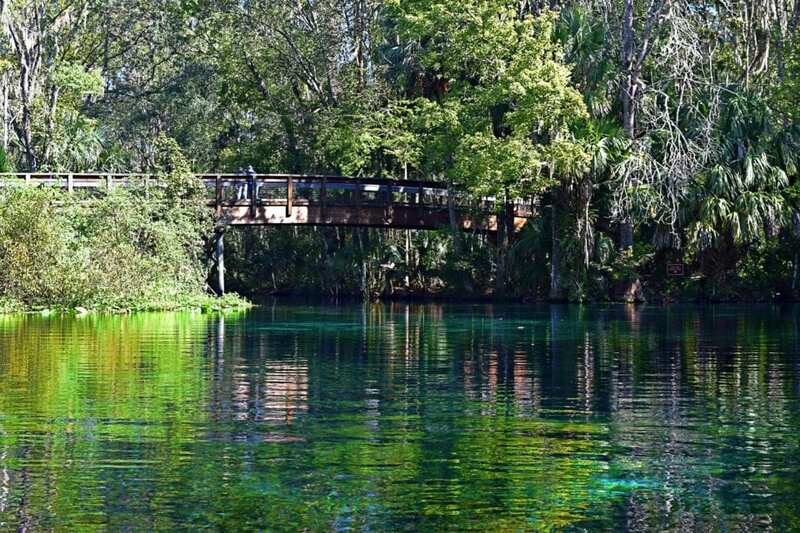 There is no other paddling experience quite like Silver Springs. The park’s spring run extends for about a mile beyond the springhead in the state park. The water is so clear that you can see all the way to the bottom. 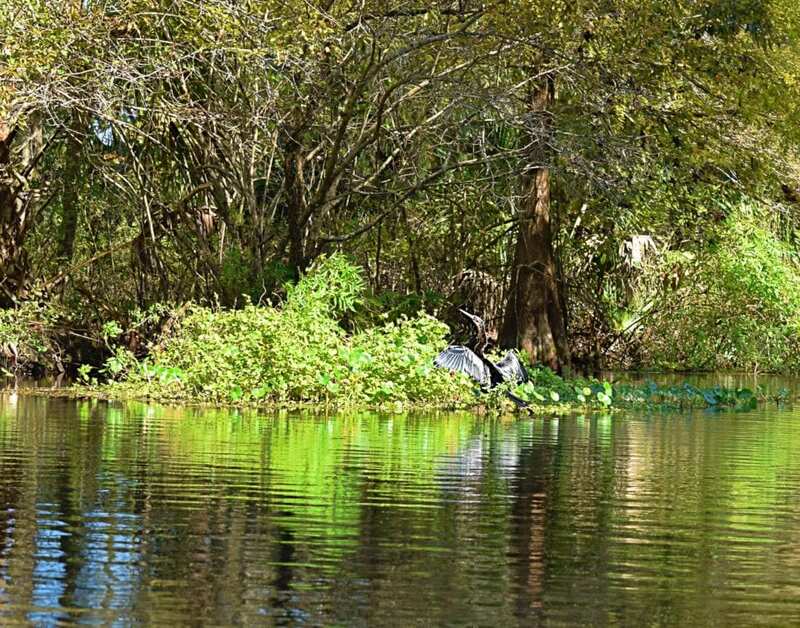 It’s a great place to observe all kinds of unique fish like the prehistoric Florida Gar or mullets jumping out of the water. 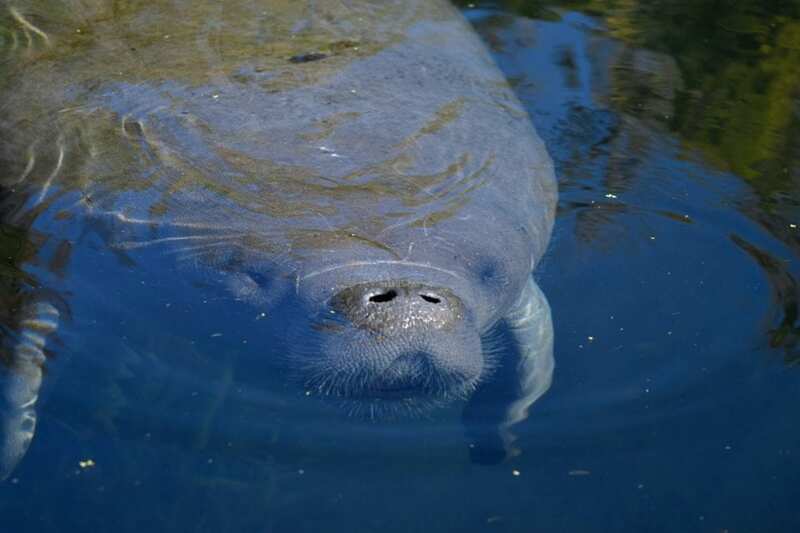 It’s also the best place to see manatees in Silver Springs. In the cool winter months, the manatees will tend to congregate in the 72-degree spring water. During warmer months, they will spread out down the length of the river. However, the viewing is better in the spring run where the water is clearer. Keep your eyes open for manatees surfacing every four minutes or so to breathe. Look for the swirls when the animal dives or its back, tail, or head as it surfaces, and listen for its deep exhale. Another great strategy is teaming up with other paddlers heading down the river to share manatee sightings. 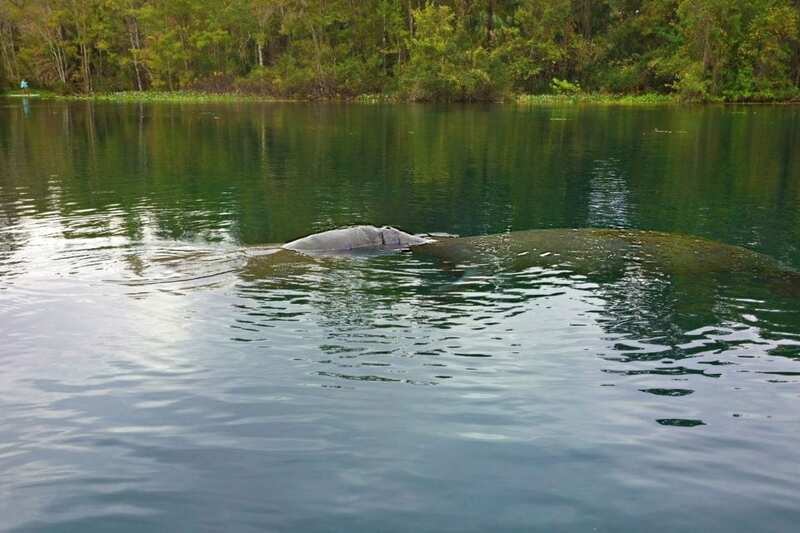 Do you want to learn more manatees and how to swim with manatees in near by Crystal River? 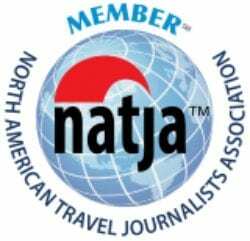 Check out our article Swimming with Manatees in Florida – Everything You Need to Know. Keep your distance and limit your viewing time so that the manatees do not notice you or your vessel. Avoid approaching or surrounding any manatees that you or others in your group come upon. 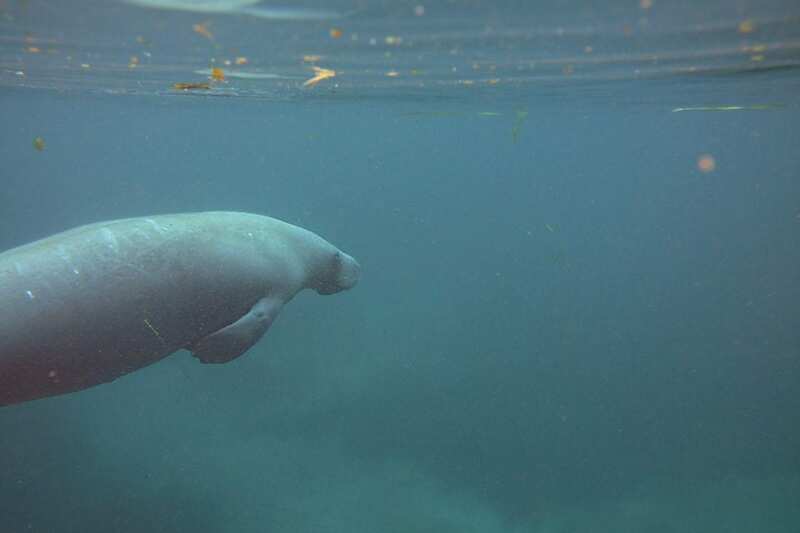 Manatees that frequently encounter paddlers can lose their natural caution around all vessels, which may increase their risk of injury when they approach motorized vessels. Manatees should not come in contact with your vessel. 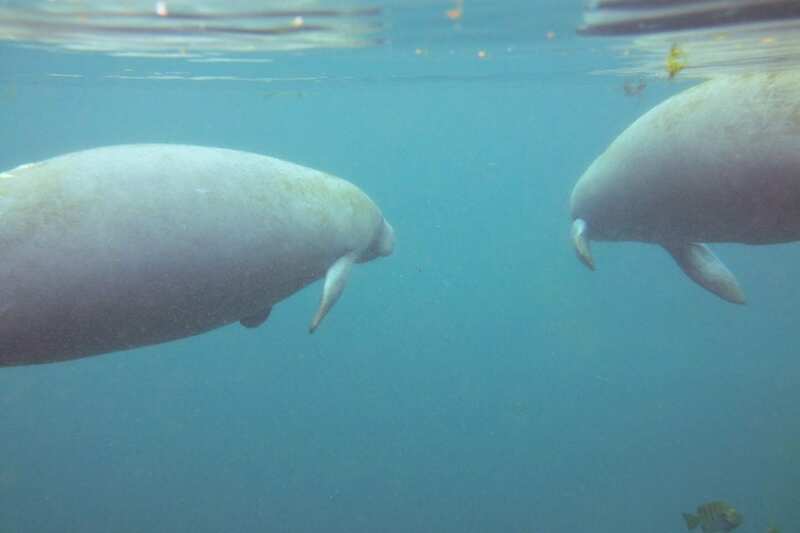 While manatees may initiate the contact, paddlers should be aware that manatees are capable of flipping a vessel. 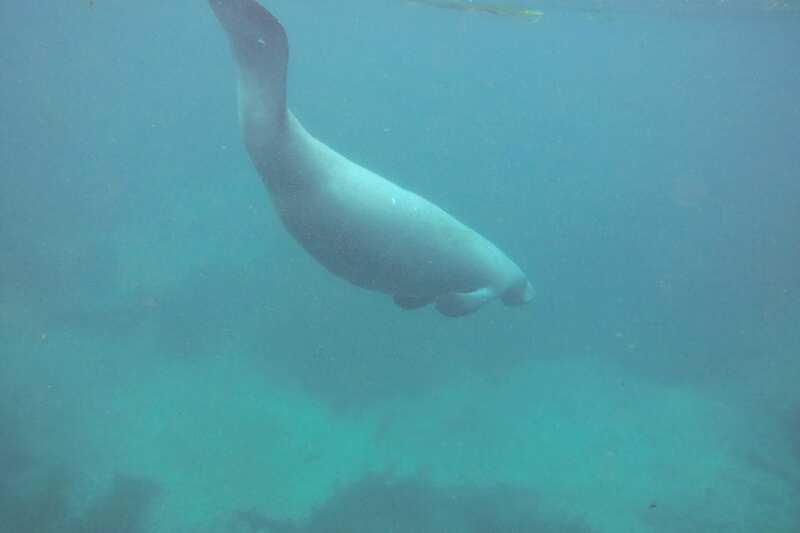 If a manatee responds to your presence, you are too close. Move away to a distance that does not change the animal’s natural behavior. Wear polarized sunglasses so that you can see where manatees are located underwater. Speak quietly and avoid making loud noises when you are near wildlife areas. Offering food or water to manatees is prohibited because it alters their foraging behavior and is considered a form of harassment. Paddle your vessel to avoid traveling over resting manatees. Manatees must surface to breathe and will startle awake if you are in the way. Give them space to surface and breathe. 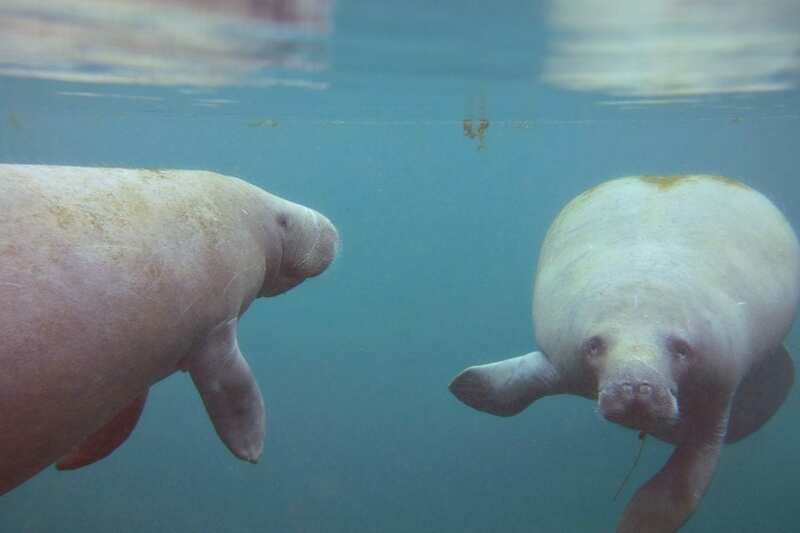 Calves (very young manatees) and juvenile manatees are cute and curious but they are not pets. Avoid the temptation to rub, scratch or otherwise touch any manatees that surface near your vessel. Remember to “look, but don’t touch” manatees. Manatee mating herds are interesting to watch as several bulls (males) pursue a cow (female) until she is ready to mate. For your safety, watch these mating herds from a distance as the animals are focused on mating and do not heed intruders in their midst. It is okay to take pictures of manatees—please do not lift, touch, hold on to or pose manatees for your pictures. Be a good role model for others so that they learn how to watch and enjoy wildlife without disturbing animals. We love love love manatees, but it’s the monkeys (rhesus macaque) that make Silver Springs unique. Where did the Silver Springs monkeys come from? The popular story that the monkeys were part of the Tarzan movies is false. Those movies contained no rhesus macaques, probably because of their foul temperament. University of Florida researchers believe that Colonel Tooey imported the monkeys for his wild Jungle Cruise attraction in 1938. The original colony was just six monkeys with six more that being added around the mid-40’s. 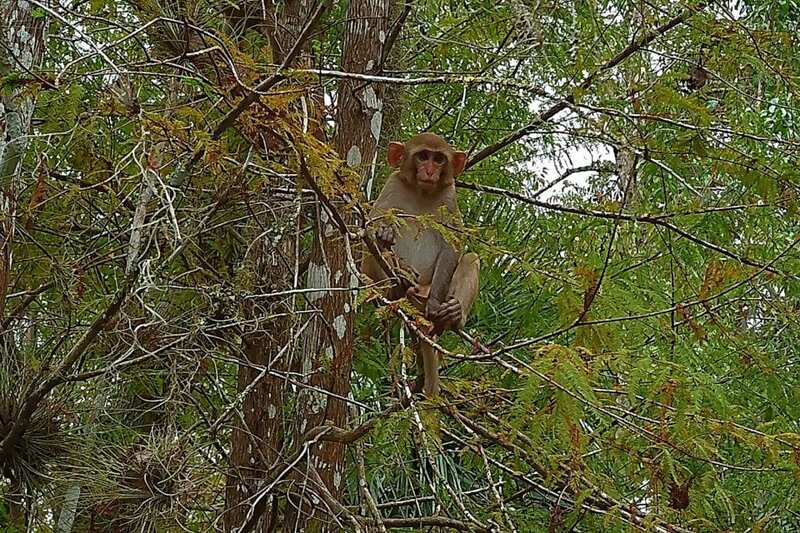 About 200 of these primates now roam the Silver Springs area. If you look carefully, you’ll observe the genetic traits of a shallow gene pool in these monkeys like their crooked tails. 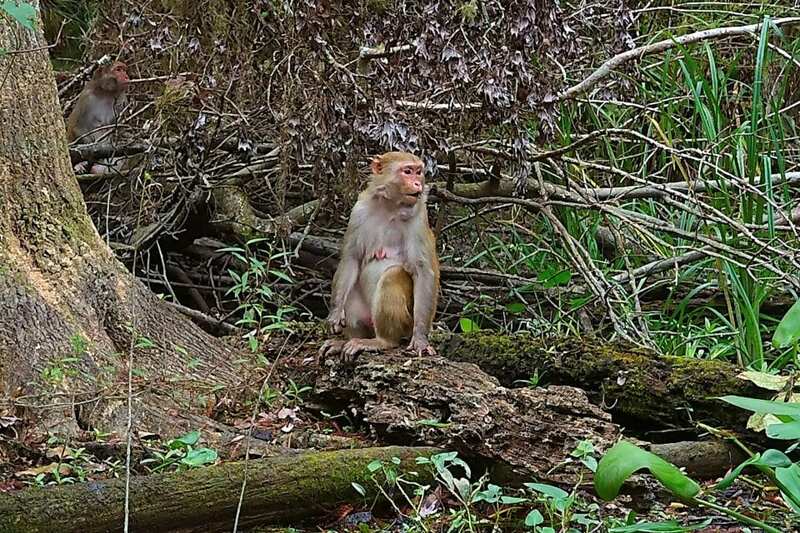 We found the monkeys most abundant in the swampy areas below the spring run. 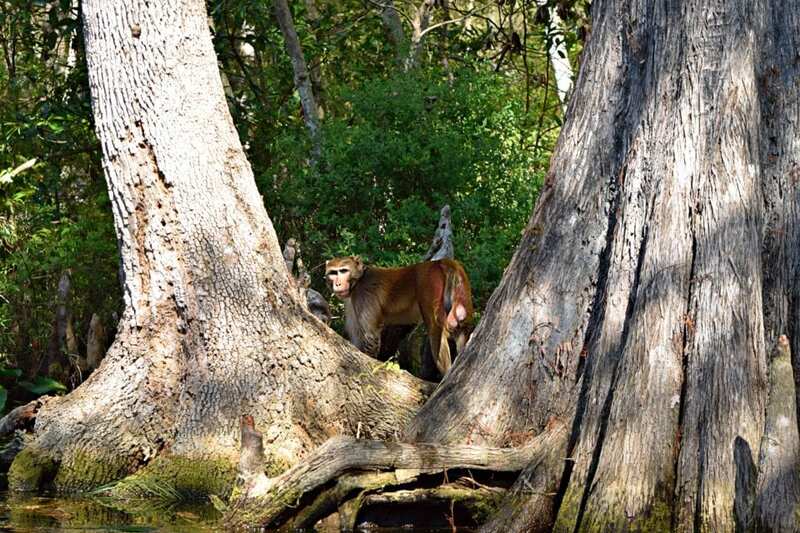 Monkeys make for exciting wildlife viewing but keep your distance. They are wild animals with notoriously bad dispositions. Studies show that they carry diseases, like herpes B, that can transmit to humans. As of December 5, 2017, it’s now illegal to feed wild monkeys. Dr. Thomas Eason, Assistant Executive Director of the Florida Wildlife Commission, says “The health and safety of the public is the Commission’s number one priority. Feeding wild monkeys creates an elevated risk to human health because it brings them into closer contact with people…” Like any wild animal, these monkeys need to be treated with respect, but, with common sense and good manners, it is possible to have a delightful encounter. Silver River State Park has just about the perfect kayak launch. 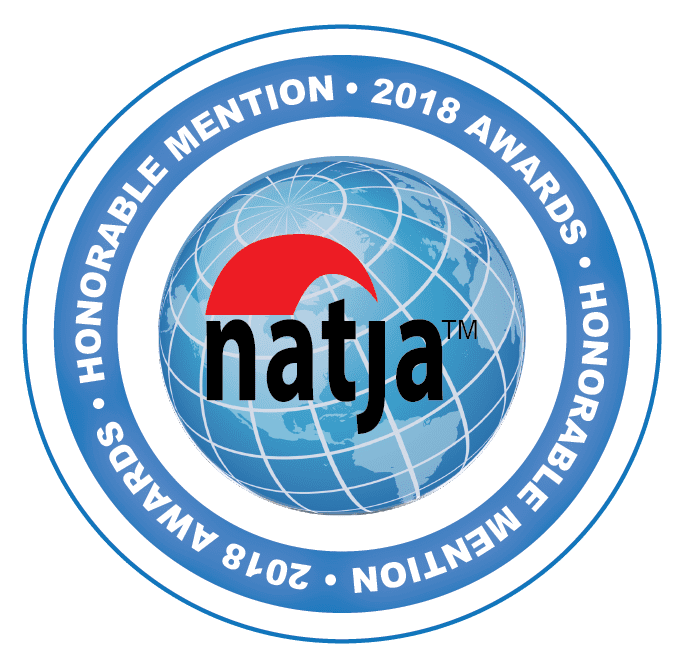 You can unload your boat about 100′ from the ramp, which has a coated surface that allows you to slide into the water but is never too slippery. In no time, you’re on the water. The first 1/4 mile to the spring pool has little current so you can work on paddling and coordination. The only difficult part is deciding if you should take the Fort King Trail or the spring run. Let me make this easy for you – take the spring run which is just past the footbridge. Silver Springs is a first magnitude spring that discharges over 550 million gallons of water a day. Because of the beautiful spring pool, It has been used as a backdrop for numerous Hollywood movies. 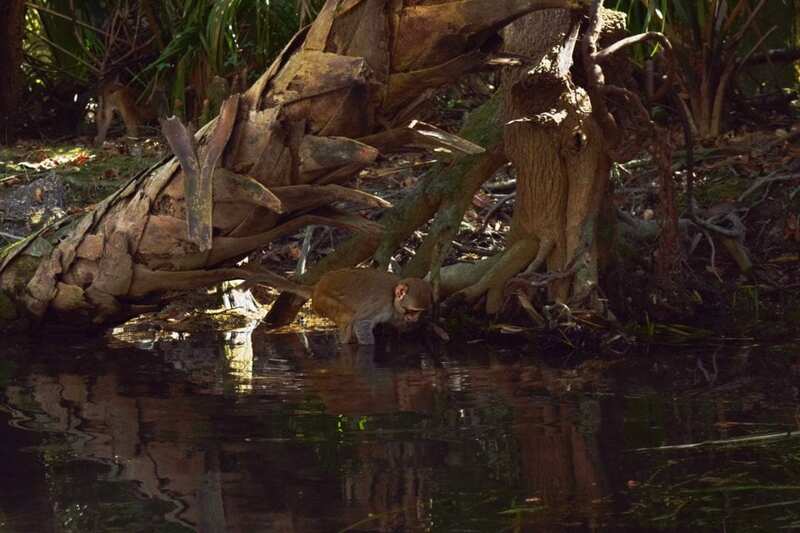 The clear water gives you incredible views of the manatees and fish living in the spring run, and there are even a few sunken treasures along the way. A collection of statues from the I Spy show can be found in the head pool. Just downstream sits the remains of a 400-year-old dugout canoe. Further downriver is a Spanish rowboat and wreck from Jerry Lewis’ movie ‘Don’t Give Up The Ship.’ It’s like a kayaking easter egg hunt. 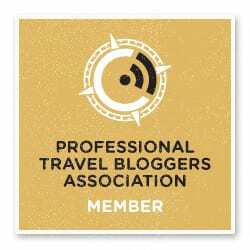 (check our map for details and remember that you can keep this map loaded on your phone and navigate from your phone.) No wonder the park runs a glass bottom boat tour down the spring run. If you want to explore the Fort King Trail, you can easily paddle upstream from the confluence .7 miles past the spring. Since the river run is 5.5 miles, you could paddle up the still water of the Fort King Trail, checking out the funky remains of Fort King as you pass, and do the spring run twice. 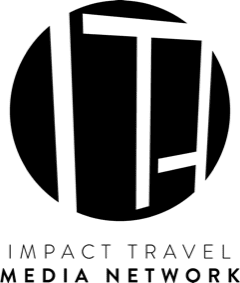 This will bump your trip up to 7 miles…. a perfect homage for an Eminem paddle (Monkey and Manatee). If you don’t like corny wordplay or excessive paddling, you can just poke your kayak in to satisfy your curiosity and then continue on downriver. 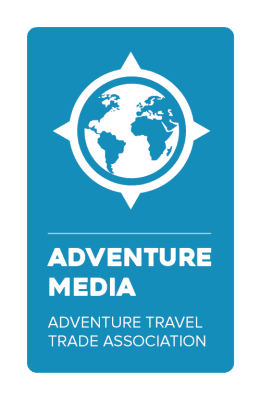 Want another great central Florida kayak trip? 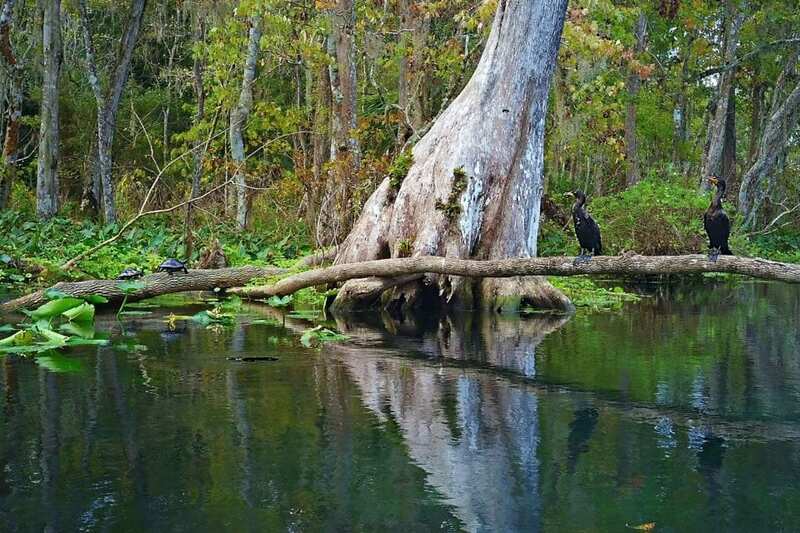 Check out our Suwannee River Guide. The river changes after the Fort King Trail junction. The tannin from the surrounding swamps clouds the water. Keep your eyes peeled for monkeys from this point on. 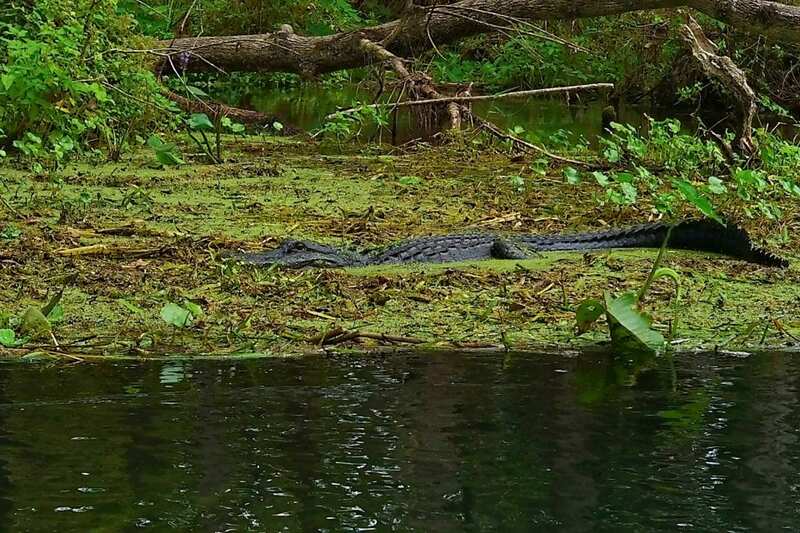 You might see monkeys swinging through trees, turtles sunning on logs, birds basking on branches or just a gator staring at you from the murky water. The drastic change between the clear springs and nutrient-rich blackwater makes this like two trips in one. 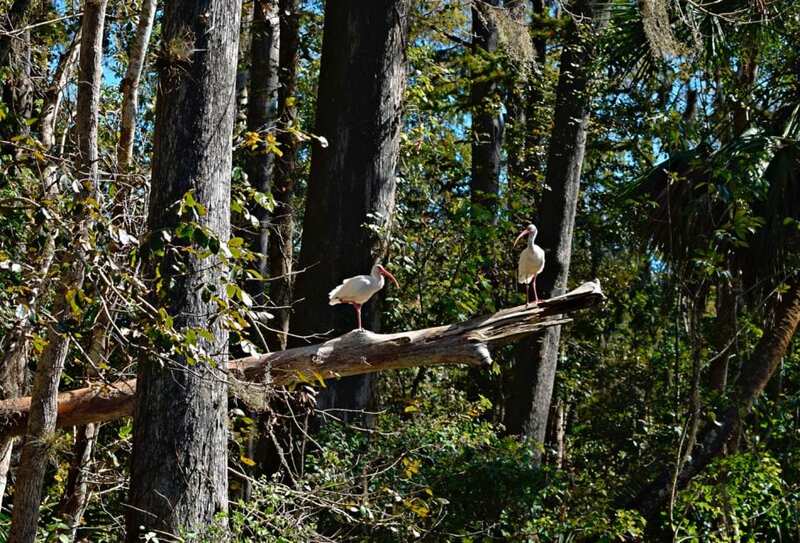 For the next couple of hours, you’ll be in an animal world floating past beautiful cypress trees loaded with Spanish moss. This trip took us about four hours to run the 5.5 miles downriver. That means, on the average, we are going slower than just floating with the 2 mph current. There’s also a good pullout the boat ramp at mile 2.0 to stretch your legs and hit the port-a-potty. You’ll notice an increase in motorboat traffic as you get near the pullout at Ray Wayside Park. Usually, I like to avoid motorboat traffic, but it isn’t a problem here. 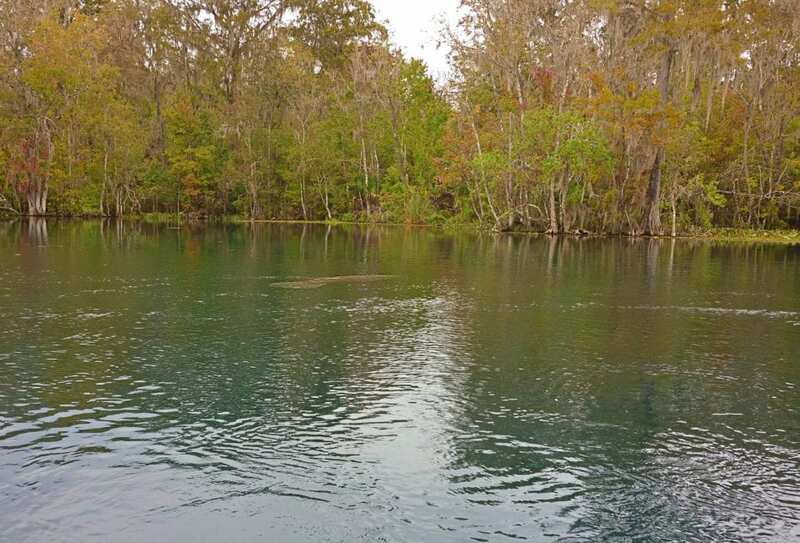 The entire Silver River is a no wake zone which protects the manatees and the kayakers alike. There is a very obvious left turn to reach the pullout so don’t be afraid you’re going to miss it. 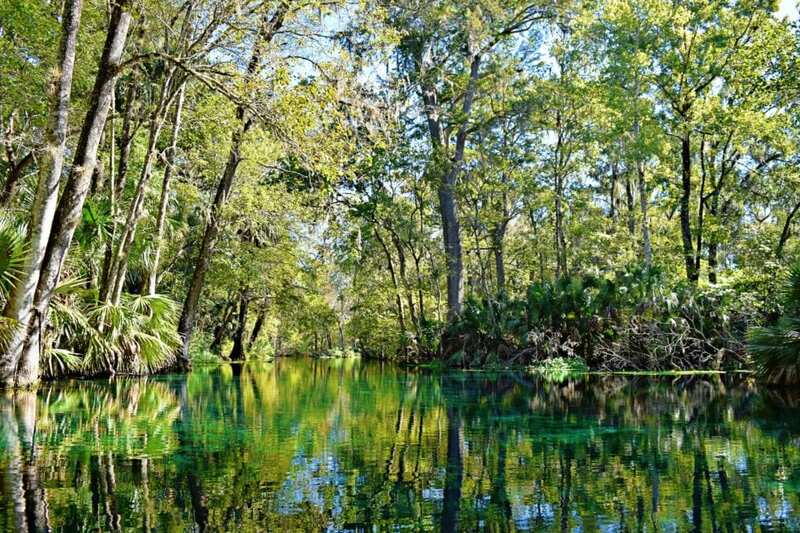 Silver Springs kayaking is an easy trip with a feast of eye candy along the way. The only thing keeping this trip from being the perfect river run is that swimming is prohibited in the clear water. 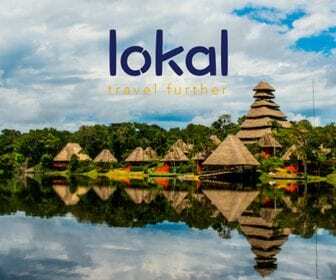 The beautiful springs and amazing animals will make you want to visit again and again.